Thank you all for your replies to my last post. I'm coping with the loss pretty well... except when I broke into tears in the produce section buying baby carrots, one of Bean Sidhe's favorite treats. As to the issue of job stress -- much of which was due to feeling overworked and under-appreciated -- I am happy to report good news. I got a promotion and a raise. :D My boss, who is awesome, also gave me a not -trivial "spot" bonus to show appreciation. I will still be super busy, but now I can feel that my compensation is more in line with my efforts and contributions. Now that I have gotten past the initial impact of losing Bean Sidhe, and I'm no longer sleep deprived, and there has been some resolution of work issues, I should be feeling less weighted down and sluggish. But I'm not. So I am beginning to suspect the inertia is being caused at least in part by a physical issue. The fatigue and weight gain I was contributing to stress and unhealthy diet. But there are two other symptoms not as easily dismissed. One, my feet are always cold. Not the chilly feet of a cold winter, but uncomfortably ice cold feet even when the rest of me is almost too warm. Two, the hair at the front of my head is suddenly alarmingly thin. Possible culprits include anemia (I've been borderline in the past) and thyroid problems (which are not unusual in women my age). I'm going to have some blood tests done. In the meantime, I'm trying to get back into the spirit of Bat Fit and make some long-overdue changes. When I've attempted to adopt healthier habits in the past, I didn't have much success with small tweaks or gradual changes. It was too easy to backslide just a little into the old habits. So I'm trying a new approach of immediate, bigger changes. On May 1, I stopped eating fast food. That has been a little bit annoying because I hate cooking, but so far, so good. On May 18, I will make two changes: no more sitting on the couch watching TV and no more drinking soda. The first shouldn't be too difficult because it's a habit only recently acquired as my dog was losing her sight. The second... well, that's an entirely different story. I have loved soda for as long as I can remember. Giving it up is going to be VERY difficult, especially at work where a fridge full of unlimited free sodas is mere steps from my desk. And for those of you who are all "Enough talking about yourself! Get on with the projects already!" (and quite rightly so! 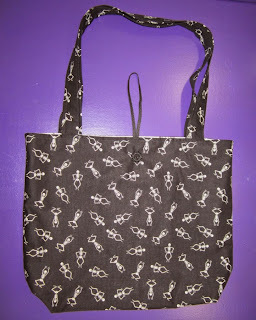 ), I have nearly completed a tutorial for a fold-up grocery tote complete with happy skeletons. I'll post it soon. Cold feet and hands - that's me. Thyroid, although I just came off the Synthroid at the beginning of this year and I'm actually losing weight. I think that has more to do with not being within 5 minutes of easy access to junk food or ordering in pizza though. And I found that drinking Perrier really helped me when I quit drinking pop. It's the fizziness I crave apparently, not necessarily the taste. I did indeed. Luckily there weren't many people around at the time. Easy access to junk food is a dangerous thing! When a Taco Bell popped up around the corner from my house, I thought, "I'm doomed!" And sure enough, I was eating there much too often. I'll have to try Perrier. I think the fizziness is what I crave also. Congrats on the promotion and raise! I hope the health stuff all works out! It's great to hear your posting again, I do miss your DIY posts. 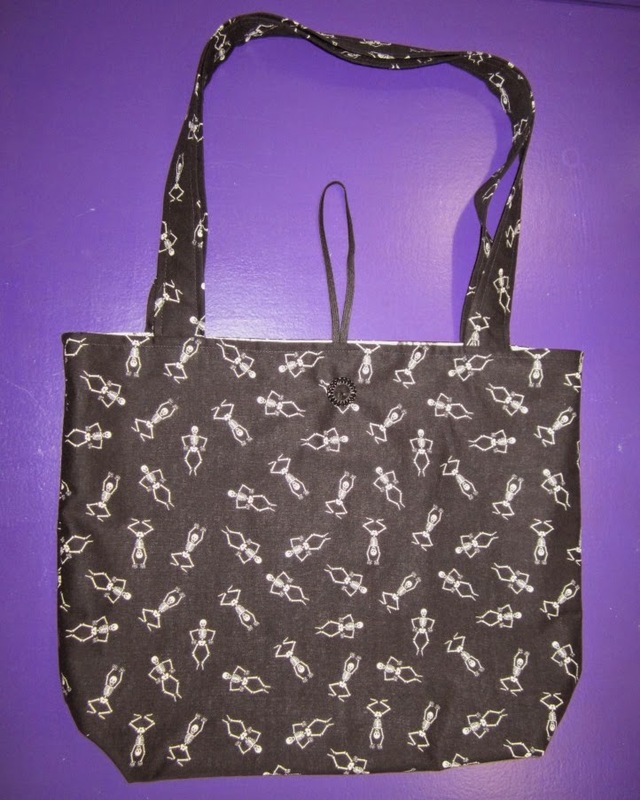 Love the bag, hope you will post on how make on soon. I gave up diet soda last summer. It was hard as hell, but I was too stubborn to break a streak. I have developed a new problem, though- seltzer water. Apparently, I was more addicted to the bubbles and the can than the actual soda. At least it's not destroying my health! Good luck. The first two weeks are not fun, but it gets pretty easy after that, especially if you're stubborn and don't like to break streaks. Good for you! I suspect it's the bubbles for me as well. Water, even if it's flavored, tastes unpleasantly flat. Congrats, Bane. Way to go!